October 1991. It was “the perfect storm”–a tempest that may happen only once in a century–a nor’easter created by so rare a combination of factors that it could not possibly have been worse. Creating waves ten stories high and winds of 120 miles an hour, the storm whipped the sea to inconceivable levels few people on Earth have ever witnessed. Few, except the six-man crew of the Andrea Gail, a commercial fishing boat tragically headed towards its hellish center. I have to be honest, I did not finish this book and yes I did count it towards my challenge because I only had about 60 pages left. The start of the book was interesting to me but towards the end I started to lose interest big time. I just think I am not the type of person who wants to read the account of something like this from someone who wasn’t there. Now I know Junger had to have done a TON of research in order to write this book so I don’t want to take anything away from him. I just prefer first hand accounts. I don’t like speculation of how things may have happened. I will say I want to watch the movie, I think that would interest me more. Since I didn’t finish it is hard to give a rating so I will just rate the parts I got through and rate it right down the middle at 2.5 since the first half kept my interest somewhat. As much as I hate to admit this I am part of the Bachelor Nation. I’m not always proud of it but these shows are beyond addicting. I am one of those fans who watch it partly because I love it and partly because I love making fun of it. I have been recapping the past few seasons here on the blog and while they are definitely the most time consuming posts once I am done I am pretty proud of them. Because I love to make fun of the show (and LOVE the show Unreal) I was so excited to read this book. Unfortunately I was a little disappointed. Don’t get me wrong it was a great guilty pleasure book and there were some secrets revealed but it just didn’t go deep enough for me. I wanted some real dirt and I didn’t get it, at least not enough of it. 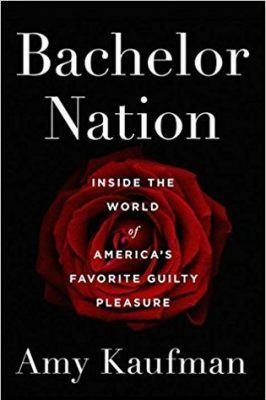 If you love the Bachelor shows you will enjoy this book but if you don’t love the shows don’t bother reading it. You will probably be bored. Rating it down the middle because it was entertaining enough for me.